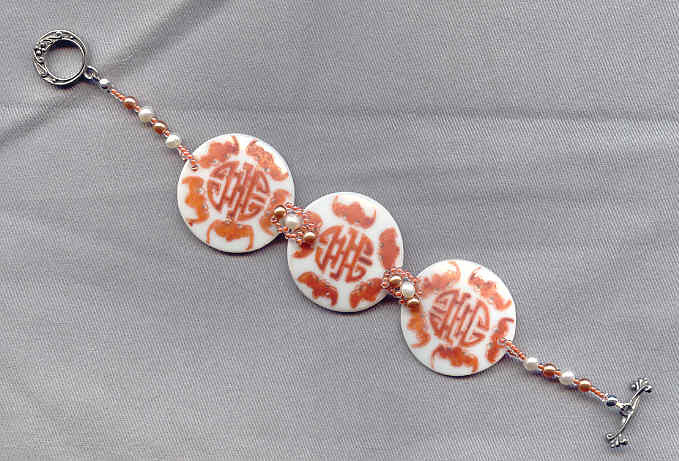 Three pretty white porcelain discs glazed with rusty-orange Asian-inspired patterns are the focals of this bracelet. Each measures about 1-1/4 inches in diameter. They?re linked together by ladders of chestnut-coloured seed beads and matching and white glass pearls. The 7-3/4 inch bracelet closes with a pewter toggle clasp. It?s simple, it?s simply elegant, and it?s from SPARKLE PLENTY. Here's a pair of earrings that is as gorgeous as it is lightweight.